Traditionally, toys imitate life. Many toys are meant to be instructive, helping children grow mentally and physically. For centuries, toys on wheels that can be pushed or pulled have fascinated children. Here you see large wheeled toys that include a wheelbarrow, scooter and a pull cart. 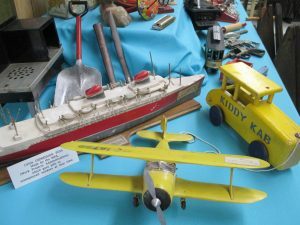 The wooden ocean liner and yellow airplane were made for children during the 1930’s as part of President Roosevelt’s WPA (Works Projects Authority) to put people to work. 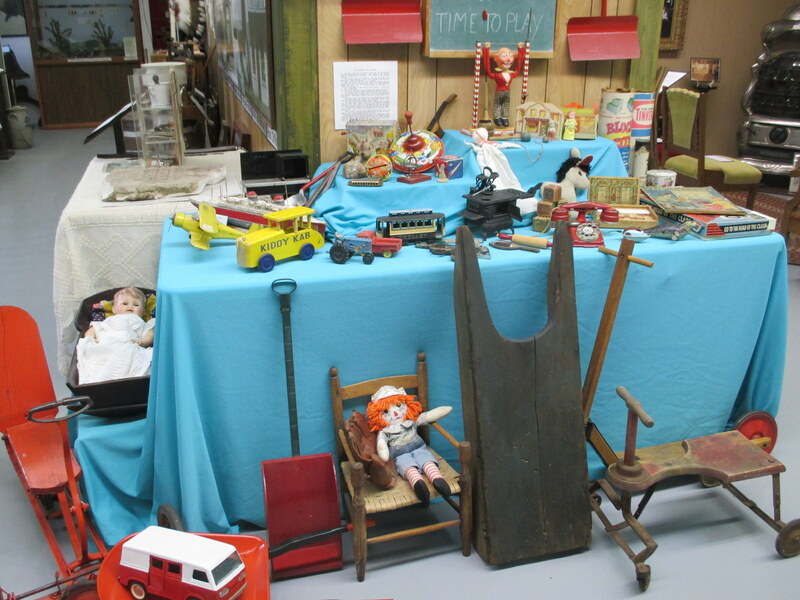 Most of these early toys were made of wood, metal, cardboard, or fabric. The handkerchief doll was easily made by a mother wishing to occupy her young child during church service. The doll crib was likely handmade and the doll’s dress as well though the doll is more modern. Raggedy Ann was created in 1915 and her brother Raggedy Andy (seen in our display) in 1920. The wooden sled may have been used on “Benny’s Hill” – pastureland where local youngsters played in the snow on the hill now bordered by Broadhead and Cook Streets west of Main Street. 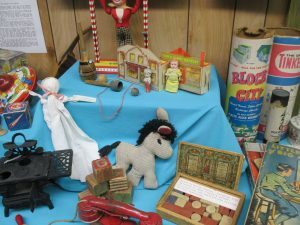 Blocks, Tinker Toys (created in 1914), board games and books were widely used by children in the early 1900’s and they continued their popularity for generations.